You will be amazed to know that there are certain types of fungi which are responsible for those fruiting and reproductive bodies of mushrooms. Mushroom is an umbrella like structure having a thick stalk topped with flat or cup shaped cap. The spores are developed beneath this cap in the form of cells, called basidia. And the spores of the fungi generated by basidia cells are known as basidiomycetes. The gills and pores beneath the cap comprise of millions of tiny spores. These tine spores are scattered and land on ideal surface through wind and animals. The small mycelium (roots) breaks through into their food source such as wood or soil and give rise to a mushroom. It is estimated that over 10,000 species of mushrooms exist all over the world. Out of these 10,000, some species are known as edible and others are poisonous. Many edible mushrooms possess good medicinal properties. Following is given a brief description of some of the different species of mushrooms. Scientifically, different species of mushrooms are classified into four different groups. This division is made on the basis of mode of feeling of mushrooms. Let us have brief look on these types. These mushrooms are known to possess a close symbiotic relationship with trees and plants. These mushrooms nurture by looming their roots cells (endomycorrhizal) with those of plant roots. Some of root cells enwrap themselves around the plants’ roots. By doing so, they enable them to transport the vital nutrients to the host root. In this way, the mushroom gets the essential glucose developed by the host plant. This will help the plant and the mushroom to flourish well with a quick pace. Saprotrophic mushrooms are known to be a good decomposer and therefore, considered environment friendly because of their tendency to produce enzymes which decompose the dead tissues or plants and animals. The decomposed matter is then absorbed by the saprotrophic mushrooms. This recycling of the organic matter continues and eventually increases the fertility of the earth. These mushrooms are completely contrary to mycorrhizae mushrooms. Unlike mycorrhizae, these mushrooms infect the host tree or plant and nourishes on the nutrients of the host plant or tree. These mushrooms don’t left enough nutrients for the host plant or tree to survive and eventually cause death to them. Some of the parasitic species even nourishes on the decayed tissues of the host plant. These mushrooms also penetrate the host plant or tree like other mushrooms. Their role as an invader is similar to those of mycorrhizae mushrooms as they improve the absorption and resistance of the host plant or tree against the pathogens. The only difference between endophytes and mycorrhizae mushrooms is that the former can be grown in the lab in the absence of a host plant. About 5,000 types of wild mushrooms are known which can be seen in the gardens, woodchips, wild roadsides, and so on. Different types of wild mushrooms resemble to edible mushrooms and it is extremely difficult for an inexperienced person to differentiate between the two. There are many edible types of wild mushrooms available in United States, some of which are given below. Morel mushrooms are known for their delicious taste and relatively easily identifiable. True morels usually appear in the spring season. Morels grow up to the length of 2 to 12 inches. The morels have their body structure covered with some fine pits and ridges and the stem is connected to the bottom part of the cap. Bearded tooth or hericium erinaceus gives you an appearance as if white fur is hanging on it. This mushroom type grows to the width of about one foot. Their pure white color helps you to locate them easily. These mushrooms appear in the seasons of summer and fall on the logs, stumps or trees. You have to keep one thing in mind that the young and pure bearded tooth mushrooms are edible; the mature yellow mushrooms have sour taste. 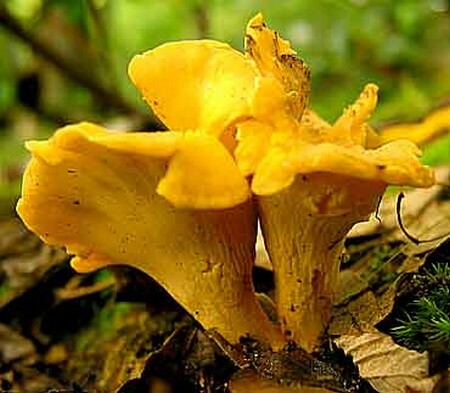 Cantharellaceae or chanterelles are the type of funnel shaped mushrooms having a wavy cap edges. These mushrooms are usually found in bright orange or yellow color. Apart from these, there is a subspecies of this type known as black trumpet which is brownish black in appearance. Fresh mushrooms have a fruity fragrance and are available during summer and fall season. They are more prominent in hardwood forests where they grow in groups. The hen of the woods or Grifola Frondosa is a type of mushrooms which resembles to wild chicken. They are large, fan shaped mushrooms found in grayish brown color. The caps of these mushrooms go beyond each other. They have white stalks that extend from a single thick base. The average weight of a single stock of hen of the wood is around 100 pounds. The characteristic feature of this mushroom is that every year it sprouts from the same point in the summer and fall season. It usually grows at the bottom of the tree or stumps. Apart from wild mushrooms, there are several different refined types of edible mushrooms which are easily available in the market. The edible mushrooms are cultivated particularly as an ingredient that can be used in several recipes. 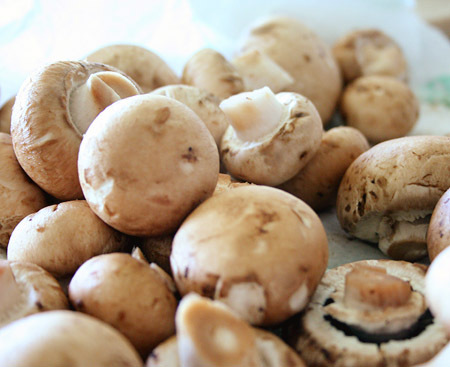 Following are given few different types of edible mushrooms. These mushrooms are also known as Portobello mushrooms and are popular for their full bodied flavor. They are cut when they are still young or premature and are used in many different recipes. Truffle mushrooms flourish well under the ground, thus are hard to locate due to this very feature. Most often, female hogs or trained truffle dogs are used to find these mushrooms. These mushrooms don’t last long after being harvested, so they need to be consumed or eaten well in time to enjoy its taste. The aged mushrooms usually lose their flavor with time. 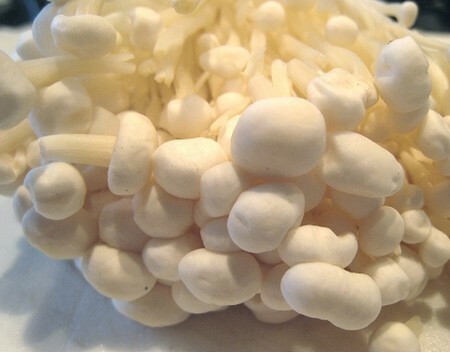 White button mushrooms can easily be cultivated in your backyard with a kit. A single kit will last for 3 months. They have a compact cap and have an ordinary mild flavor. You can use it in different dishes such as meat, salads, pastas, soups, etc. They are most commonly used in stir fry recipes, and soups. They are small and round, having a long stalk. They are known for their crunchy texture and fruity taste. These are the few different types of mushrooms found all over the world. The important point here to mention is to develop a good sense of distinguishing between wild mushrooms and edible mushrooms. Poisonous wild mushrooms can extremely be dangerous if ingested. In case you eat the poisonous mushroom, they symptoms may take hours or even days to appear. So, it is really critical to know about different types of mushrooms. If you are unsure about any mushroom, don’t eat it or use it in recipes until you are sure enough that it is an edible type and won’t harm you.